Major European nations joined the United States on Monday (4 February) in recognizing opposition leader Juan Guaidó as Venezuela’s legitimate head of state, while a separate regional bloc meeting kept up the pressure on socialist President Nicolás Maduro. 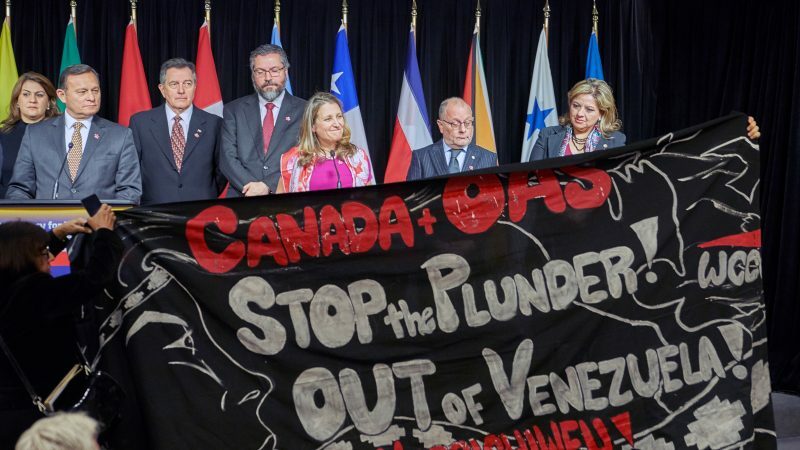 The 14-nation so-called Lima Group, which includes Canada and Latin American countries such as Brazil and Mexico but not the United States, met in Ottawa to discuss the way forward on Venezuela. Although Washington has broached the idea of an oil embargo on Venezuela, the Lima Group looked set to hold off imposing more sanctions, sources briefed on the matter said. Inside the country, Guaidó is vying to lure military commanders to switch their allegiance to him away Maduro. Here is a summary of whom key players are backing, after Guaidó declared himself acting president on January 23 in defiance of the leftist Maduro. Military: Maduro through his allies controls most of Venezuela’s main state institutions — most importantly the military. Senior officers have reaffirmed support for him, though there have been signs of wavering. A senior air force general recognized Guaidó as president on 2 February. – China: Venezuela’s biggest creditor, with some $20 billion dollars owed, says it opposes “external interference” by those who have recognized Guaidó as leader. – Russia: Venezuela’s number two creditor also backs it militarily: In December, Moscow sent two bombers and some 100 officers to Caracas for joint exercises. President Vladimir Putin has also accused the US and its allies of “interference”. – Other allies: Bolivia, Cuba, Iran, North Korea, and Turkey continue to back Maduro as leader. – United States: US President Donald Trump quickly recognized Guaidó after he proclaimed himself acting president. Trump said on Sunday that the US army’s intervention in Venezuela was “an option”. – Central and South America: Argentina, Brazil, Chile, Colombia, Costa Rica, Guatemala, Honduras, Panama, Paraguay and Peru followed, as did the head of the Organization of American States, Uruguayan Luis Almagro. – European powers: Austria, Britain, Czech Republic, Denmark, Finland, France, Georgia, Germany, Latvia, Lithuania, Luxembourg, the Netherlands, Poland, Portugal, Spain and Sweden recognized Guaidó on Monday. The European Parliament has called on all EU countries to do so. – Australia, Canada and Israel are among other countries to recognize him. – Uruguay and Mexico have not recognized Guaidó, both taking a neutral position in calling for a negotiated solution to the crisis. They have called for a conference of countries and organisations that have taken a “neutral position” for 7 February. – Italy does not recognize the result of Venezuela’s presidential election last May, which Maduro won, and wants new elections as soon as possible, Italy’s foreign minister told AFP on Monday. – Belgium’s deputy prime minister Didier Reynders said it supported Guaidó’s “mission to organize free and transparent elections”, but stopped short of endorsing him as acting president. – Norway’s Foreign Minister Ine Eriksen Soreide said the country does not recognize Guaidó as acting president and called for fresh elections. – Greece’s left-wing government declined to join other EU states in overtly backing Guaidó and called for dialogue to resolve the crisis. – United Nations Secretary General António Guterres said he was available to facilitate negotiations between the rival sides in Venezuela.